I have always maintained that entrepreneurship is a state of mind. It's a state in which you have to be flexible, alert, aggressive, inspiring and positive and use every low as a learning opportunity to bounce back. My journey to build HCL has been a roller coaster ride - with highs and lows; with its adrenaline rushes; with its setbacks and learnings, and finally, with a lot of fun. I am keeping this anecdotal to help whoever reads this connect with real-life situations - something that I believe many young entrepreneurs or aspiring ones may find useful. Most entrepreneurs make the mistake of inadequate bandwidth creation and utilisation. From the very beginning, we ensured that we had people amongst whom we could divide work. So, an organisational structure was put in place even before we had office space. Our bandwidth came from the partners or executives we had hired. IF YOU ARE JUST AN ENTREPRENEUR, YOU HAVE TO DO ALL SORTS OF THINGS... FIRST, YOU NEED TO TAKE UP ANY WORK IRRESPECTIVE OF WHO YOU ARE in the hierarchy. Second, there is only so much you can do as an individual. You need to distribute work among your team members. Once, we tried to apply for a loan at Syndicate Bank. So, I took the first meeting with the bank because I was the Managing Director even if the company was too small at that time. After the meeting, my fellow director stayed back to complete the documentation and get the loan. There is one bank where I used to go every day and check what all has been debited and what all is credited. I used to do that to see the daily cash balance. It was just that we were running with very tight cash balances. If you are just an entrepreneur, you have to do all sorts of things and you have to ignore everything else. The simple point that I am trying to make is that first, you need to take up any work irrespective of who you are in the hierarchy. Second, there is only so much that you can do as an individual. So you need to distribute work among your team members. One day, my wife dragged me to watch a film with her. There is a movie theatre called Paras in Nehru Place in Delhi, which is where our first registered office was. So we went for a 10 p.m. show and after the movie, I saw that the lights on the eighth floor (HCL office) were still on. I saw all those lights and wondered: it's a very wasteful habit to leave the office lights on. When I shared this with my wife, she said: "I think everybody else is working except you, who has taken his young wife out for a film." The elevator had stopped working late in the night, so we decided to walk up. When we reached, we saw everyone was there. Everyone just loved the company and did not want to go home. Even during the start-up years, we never made any compromise on the quality of hires. We have always gone to the IITs and IIMs from our early days. The reason we could attract some of the best minds was because of the richness of work at HCL. Many IIT students who left India for the US to study further or to do a job, never got down to actually doing design work. At HCL, they got an opportunity to lay hands on a microprocessor and do real design work. The US economy went into a recession in early 2001. The stock market crash prolonged into 2002 when Nasdaq touched a low of 1,100 (one-fifth of its peak). Dow Jones touched a low at 7,200 levels, losing $5 trillion from the January 2001 levels. Nearly 76 per cent of our revenues at that time came from the US. We were pushed to the corner and had no choice but to look for new opportunities and create our Next Big Practice. HCL, at that time, had some anchor customers in health care and aerospace. Our ability to leverage our core skills in hardware, software and networking opened up two whole new markets and revenue streams for us. We consciously invested in building new competencies, tools and processes. The ERS (Engineering and R&D Services) practice in HCL is one of our key growth pillars and contributed 17.1 per cent to our revenues in the first quarter of 2014/15. I am fearful, but I do not act on fear. Andrew Grove's book Only The Paranoid Survive is very close to my heart. I have always believed that the paranoid strive for the best, but are always prepared for the worst. One needs to identify and exploit every crisis point that challenges the business. In the 1970s when we started, HCL had five products. The minicomputer was our big bet. It failed miserably and we stopped production. The 8-bit processor system was a big success and lasted12 years. The KTMF (Key to Mini Floppy) ran for 15 years but our cash register bombed. However, the programme calculator kept the fireplace going. The NIIT story is another fitting example. In those times, we needed to invest in training but could not afford to actually put our profits back into training. While the industry badly needed trained manpower and we were struggling to find the resources, no one had the financial muscle to invest in training. I went to Singapore and visited Edutronics, a training company, and saw the first opportunity. NIIT was born in 1981. In 1997, NIIT crossed $1 billion, the biggest success story in technology training in India. >> How do you look at board formations? >> How do you take a risk decision in the board? >> How often does a father and a son disagree in the board and if there is a disagreement, whose decision carries through? >> How many family members are there on the board? >> How important is professionalisation of a board? >> How closely do nominations and remuneration committees evaluate the CEO's and the CFO's performance? How long does it take to decide on a salary? The example of an effective board in the current times is that of Microsoft. The company has been led by two iconic men in technology - Bill Gates and Steve Ballmer. Microsoft's market capitalisation in the second week of November was $410 billion. What was it on the day Ballmer said he was stepping down? About $290 billion. And what was the cash balance on both days? $90 billion. So the enterprise worth shot up exponentially on the leadership transition. This happened because the board acted in the best interest of the organisation and shareholders. >> Focus on the weak signals and make the most of the environment. >> Ensure that your aspirations exceed your resources. >> Stay paranoid, stay successful. 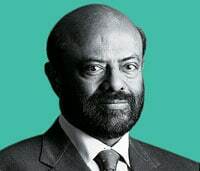 ABOUT: Shiv Nadar is among India's most successful first-generation entrepreneurs who took a bet on hightech when it was a tiny business. What makes his company HCL's journey different from that of its peers is its strong engineering roots. The HCL group, with revenues of some $7 billion, is focusing on education and health care as the next two businesses it wants to make a big impact in.